Will Our Sport Live Or Slice Its Own Wrists ? The following missive is my opinion only and does not in any way represent any other companies position on this issue or any other person's view. Feel free to consider it uninformed opinion, perhaps with a little bit of naiveté or idealism mixed in. But folks, I see a problem in our community, and I think it is high time that we start thinking less of our little niche and look at the big picture - for that is what our enemies are doing, and if we are not careful we shall play right into their hands and be destroyed not so much by their actions, but by our own inactions as a group. If you are reading this chances are pretty good you are a gun owner. What type of equipment you use for your sport is beyond my ability divine but I can bet one thing... if you are like most of those of us who partake in the shooting sports you have your own little niche, a particular area that you like best. It might be that your special place in the shooting world is busting clays with a Perazzi Shotgun or drilling itty bitty groups at 1000 yards with a Nor-Cal Precision Sniper Rifle. Perhaps it is plinking cola cans at 25 feet with a Henry Lever Action 22 rifle or serious handgun competition with a Jardine's Custom 1911 handgun. Maybe you just like the relaxation of knocking over paper cups with an old Daisy air rifle or the exhilaration of mowing targets with a licensed Class III machine-gun. You may carry a weapon for self defense or you may only shoot 'rail guns' or do the most exquisite precision benchrest shooting. Some find their love of the shooting sports embodied in the M16 lookalikes that Bushmaster puts out while others think the ONLY way to go is the ultra long range heavy rifle shooting that can be provided by an EDM Arms Windrunner. Then there are those who use the off-the shelf goodies from Remington and Winchester to hunt any sort of game - from quail to moose. Some of you may even find collection old beat up war relics like the M1 Garand or SKS to be fascinating. Whatever your specialty, the chances are also pretty good that you are very in tune with your own group and it's peculiar cliquishness. As I speak to people at gunranges and in trap fields and as I peruse the Internet reading this or that bulletin board I have come across a very disturbing trend. This trend, which doubtless started out as friendly sparring or perhaps a little bit of ego or envy is that the different groups that comprise the community of gun owners generally find something to dislike in each other. How many times have you heard things stated openly or in hushed tones within your shooting circle that play into the hands of those who would love to see ALL of us disarmed? How many of you have participated in the following sort of behavior? Have you ever stood around the clubhouse and slandered those "wierdos" walking up to the rifle range in cammies? Have you ever bitched about the "stuck-up perfumed princes in their little wussie vests" on the shotgun range? Have you ever suggested agreement to the statement that that "nobody needs a magazine that will hold THAT many rounds"? Have you tacitly or demonstrably agreed that "Rifles and shotguns are for sport but handguns are simply for killing people"? Have you secretly been happy when the locals closed down the local snobbish guys shotgun range because of "lead poisoning" in the area? Have you ever referred to a shotgunner as "just another stupid Elmer Fudd"? Have you decried that some guy with a semi-auto really has no need to shoot so many bullets so damned fast? Have you made mention of the only reason someone shoots shotgun is because they cant handle decent trigger control? Have you declared that there is really no need for the Assault Weapons bill to sunset in 2004 because it does not affect anything that has a "legitimate sporting purpose"? The above list could go on and on and on, but you see where I am going with this. The bottom line is that those involved in the shooting sports are about to have some REAL problems because of the attitudes mentioned above. The sad thing is the statements made above have been made repeatedly by folks in our own camp... members of the shooting fraternity who really should know better. As human beings it is in our nature to be competitive. It is in our nature to 'flock with our group' and to further segment ourselves within that group so as to be closest to those who we find the most agreeable.... indeed those who are most like us are most likely to be our friends and associates... even if the differences are minor for other available allies. The problem happens when that segmentation.. (dare I call it factionalization?) becomes a problem for us all. The bottom line is this. 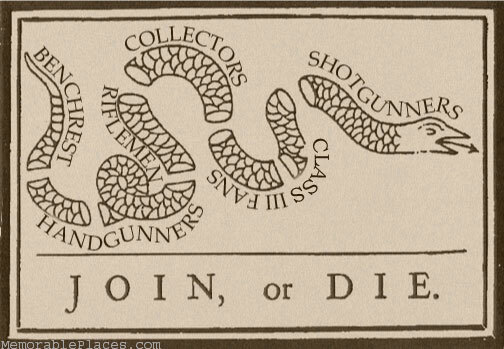 As shooting enthusiasts we must, for once, ALL come together and fight the larger enemy or we shall ALL lose our collective rights to own ALL of our sporting arms. It is a common tactic in any negotiation or confrontation to attempt to break apart the opponents group. Look at this on any level and you will find examples. From the playbook of the local highschool football team to the directives from the Psychological Warfare centers for the superpower armies the thread runs constant. Keep the opponent off balance by either generating or encouraging those in his ranks to work against each other. Those who would strip us of our rights do the same damned thing. Let history be a lesson to those who think that because the things that they hold dear have not yet been hit that it will always be so... particularly when others within their group are being attacked from outside. The real problem in this political war, and yes I believe it is a war, is simply that as a macro-group we do not stand as one. Time and time again the politicians and the forces aligned against us like the 'Brady Bunch' and other gun-control proponents keep 'boiling the frog'. That is to say they keep stealing our rights little by little. Each time they strip away a small bit of our abilities but they bounce from one segment of the shooting population to another. Sometimes its handgunners - 'Saturday night special' laws. Sometimes its shotgunners - newest assault weapon laws. As time marches on what the previous generation of shooters never thought could possibly pass does... each time these things are passed by legislature who gives an implied or stated promise that the new law was simply the next "reasonable level" of gun control and that it would "stop at this point". It never did. It never will. Gun control proponents steal our rights incrementally and in most cases fairly slowly. For they could not strip Americans of our freedoms in any other fashion without a truly bloody revolt on their hands. 1927 - Law banning mailing of concealable firearms passed. 1934 - National Firearms Act of - Regulated fully automatic firearms imposing HUGE taxes on them. 1938 - Federal Firearms Act of 1938 - limited selling ordinary firearms and established FFL as well as sales records required for those who deal in firearms. 1972 - BATF formed begins 'compliance inspections'. 1977 - Washington DC basically bans handguns and requires registration of rifles and shotguns. 1986 - So-called Law Enforcement Officers Protection Act - Banned importing numerous semiautomatic 'assault' weapons added "Gun-free school zones" banned bullets capable of penetrating certain materials. 1989 - California bans so-called assault weapons based more on looks than on function. 1990 - Imported so-called "assault weapons" ban. 1994 - Brady Handgun Violence Prevention - Imposed a five-day waiting period on the purchase of a handgun on a national level and required local law enforcement to conduct background checks on purchasers. 1994 - Violent Crime Control and Law Enforcement- Banned sale, manufacture, importation, or possession of a number of specific types of so-called "assault weapons". 1997 - Major gun manufacturers basically forced to agree to include specific safety features such as locks on or with their weapons. 1998 - City governments file product liability type lawsuits against gun makers. 1999 - More local government civil actions filed against gunmakers. 1999 - Senate demands gun-show (private party) sales be subject to background checks. Extends waiting periods. 2003 - HUGE expansion in bans proposed in congress. 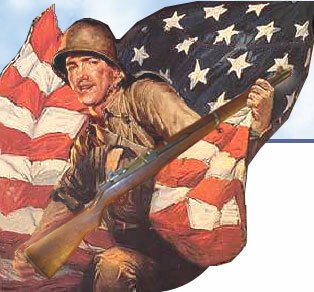 Would ban semi-auto SHOTGUNS, old rifles such as the M1 Garand, and even banned making of parts to repair old firearms. See a pattern? We are getting "nickel and dimed" to death! Who Are The Guilty Parties ? ? ? ? It is CRITICAL that we do not let our differences stand in our way. Who is guilty? All of us... each and every gun owner that has not stood up when ANY of us have been attacked has screwed up. GUILTY! - Those of us who cared more for our rifle shooting have in the past stood by when some little dictatorial county bureaucracy has insisted that the lead shot fired by shotgunners somehow was destroying the environment and thus made our fellow shooters use shells costing 25+ bucks a box. GUILTY! - Those of us who stood by and ignored it as the wheels of the legislature banned weapons because they were 'ugly military weapons'. Thus allowing our brother shooters to have their previously legal arms turned to instant felonies. GUILTY! - Those of us who feeling secure with our rifles and shotguns allowed "Saturday night special" ordinances to be passed. Thus allowing those of us who may not have the money for high dollar arms to become criminals by the stroke of a pen. GUILTY! - Any gunowner who has continued to support firearm companies who have entered into agreements with the government and/or supported legislation that in ANY way detracts from our ability to purchase the weapons we have a right to own. GUILTY! - Any owner of a firearm who has ever suggested that we just 'give the legislature a bone so they will leave us alone'. Folks... appeasement does not work. It never has. Those who would take our freedoms love nothing more than to get these little compromises every year. If we give away only ONE thing every year, this generation will not be able to pass on the shooting sports to our youth because not ONE gun will still be legal. The time has come to ROLL BACK gun laws. There is absolutely NO possible way that we can survive as a community doing the same things that we have done for the last 30 or more years. The best and most responsible citizens of the USA are to be found in our ranks. We also damn well better become the MOST politically active! The solutions are obvious... Join up with not only the NRA (who I opine has not fought NEARLY as hard as it should have) but also with at least one or two other pro-gun groups. You also MUST get involved locally. Every single time the city or county votes on a gun measure you SHOULD be there! We need to convert people. Take people shooting... join in debates at work or in other environments.. but come with incontrovertible facts... and do not get nasty. We will win or lose this battle one person at a time. Stand fast. Above all else, make sure that your legislators who vote for gun control measures are NOT returned to office. The second amendment is a litmus test in my opinion. Should a person be FOR gun control they are also AGAINST all other freedoms which the second amendment is there to protect. Work against these people. Contribute time and funds to their opponents. And most important of all, you and your family MUST VOTE. Vote every single time and vote based FIRST on how a candidate stands on gun control. This missive was written by Charles of memorable Places Consulting. 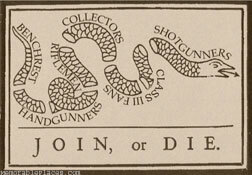 You are free to copy the text and post it anywhere that is anti-gun control, be it on a website under your legal control, or on any bulletin or message board that is pro second amendment You are free to use and distribute the "Join or Die" graphics below under the same conditions. I would appreciate a link back to this site but it is NOT required. Take care of our constitution friends... we will not have a second chance. Thanks for taking the time care about the future of the shooting sports!